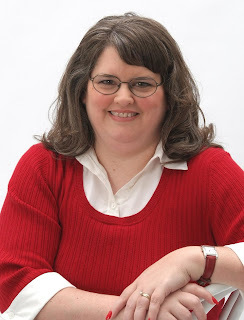 Welcome to Patterings, Erica and congratulations on your debut novel! I started writing for pleasure in the spring of 2004, after a lifetime of daydreaming, writing stories in my head. When I started putting words onto the page, it was like a part of my brain that had lain dormant for a long time woke up. I knew then that I wanted to be a writer, to pursue publication. This is such a hard question, because when I’m writing, I’m totally immersed in THAT book and in THOSE characters. They are all special to me, but if forced to choose, I’d have to say The Bartered Bride will always hold a special place in my heart, because it was my first published novel. But from what I’ve heard, I’ll feel just the same about each one as it comes out. Writer’s Doubt. I second-guess myself, think I’m writing drivel, worry that no one will like it, etc. Overcoming it? I have to preach truth to myself. I have to trust that God will help me tell the story He’s laid on my heart. It also helps that I have some fantastic (And WAY picky ;) editors who fine-comb the manuscript before the world sees them. They don’t let me get away with anything, and I always feel more confident after they’ve gone over a story and approved it. Abraham Kennebrae, a manipulating, scheming, driven old devil who always tries to maneuver things to his benefit. And yet, I felt for him, a titan of business now confined to a wheelchair. Probably the most interesting thing about Abraham was that he feared losing his grandsons, but his manipulation of them very nearly brings about the thing he fears the most. And don’t you find that to be true? We bumble about and actually contribute to causing our own downfall quite often. 1.I can’t sleep with my feet covered. 2.I don’t walk on grates or manhole covers. 3.I love to watch cooking shows, but I don’t like to cook. LoL--I'm with you on the manhole covers! In Ecuador there weren't any manhole covers because people stole them, so you always had to be careful not step IN them! Scary. Absolutely. I hate conflict, and I put off anything that smacks off it. Eventually, I have to force myself to deal with a situation, and then, I feel like road-kill for a good long time afterwards. Oh man, I don't like conflict either! Wake up early and have the luxury of reading in bed for awhile. Check blogs and email, hang with my kids, then head to my local Caribou Coffee to write for awhile. Spend the evening with my family, doing jigsaw puzzles, watching movies, etc. I have such wide tastes when it comes to reading. I love historical romance (obviously) but I read mysteries, a little horror, thrillers, contemporary romance, lits, it really depends on the story and the author. I’ll read any good story. Caribou Coffee, Earl Grey Tea and Orange Cranberry Scones. The sovereignty and forgiveness of God seem to pop up a lot in my work and in my life. That my most teachable moments come when my expectations are not being fulfilled. Oh ouch! I can relate to that one! You can purchase The Bartered Bride: from Heartsong Presents and CBD. 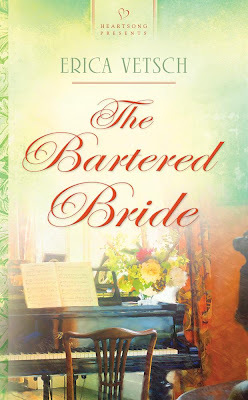 Erica is giving away a copy of The Bartered Bride. To be entered in the book giveaway, leave a comment and check back on Sunday, October 25th to see if you've won. You can enter twice--once for each post you leave a comment on (yesterday's and today's). If you want to guarantee that you're notified if you win, then leave your email address in the comment, otherwise, you can just check back and email me through the button in my sidebar. **Annoying little disclaimer: This giveaway is void where prohibited; open only to U.S. addresses, odds of winning depend on number of entrants. No purchase necessary. I would like to read this book. Thanks. Abraham sounds a little like someone I know. I'm reading Erica's book right now and it's AMAZING. Her conflicted feelings for Abraham really come through in the writing. what a fabulous post...would LOVE to read this book...thanks for the opportunity. What a great interview, Erica. I'd love to win the book. I love to read debut books, especially.